What? No velociraptor genes - the better to chase the faux-Native American ones Senator Warren apparently still doesn't possess? I'm rather suspicious of that 1/1032. 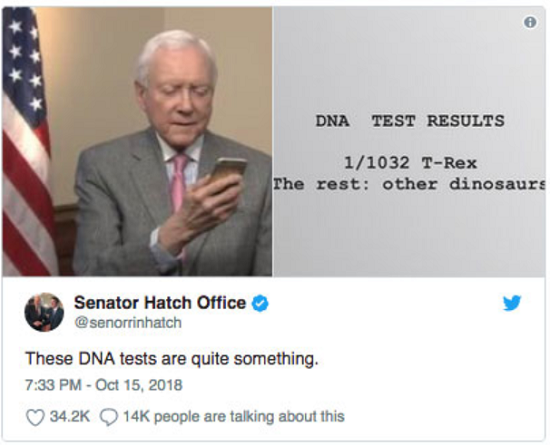 Sounds like dinosaurs had mighty complex genetics, or else there were many T-Rexes in his family tree at varying removes, from the 11th generation on back. A great laugh for the morning! Thang ya, thang ya ver' muuuuuch. I was wondering when next book coming. Loved last trilogy. Was wondering if ever go to the big Tulsa gun shows in November or april. Notice post about weapons. We get lot of out of state visitors. @Kevin Harrison: Watch in November and December, God willing! One thing someone needs to explain to me is how you can possibly have 1/1032 of your DNA from some ancestor. I was taught that the irreducible minimum (at least for nuclear DNA) that you can get from an ancestor is one chromosome, which would be 1/46 of your DNA. I was under the impression that chromosomes do not split except possibly in someone with Down's Syndrome. Am I wrong? It is possible to have genes not chromosomes inherited from a further back ancestor. Genes like to Rambo betweenmatching chromosomes in an process called chromosomal crossover which can happen during meiosis. Chromosomes don't split, but the complementary chromosomes that you got from your father and mother do swap genes during the creation of gametes. So there's no exact percentage of genes that comes from any ancestor other than your parents.